Commercial-grade quality, yet fashionable. Available in six Airflow Mesh fabrics that block much of the sun's rays yet allow a muted view of the scenery, and over thirty solid-woven solid and stripe outdoor fabrics, which provide 100% sun protection and privacy. 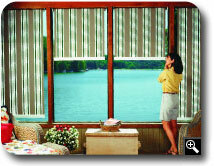 Block approximately 70% of the sun's harmful rays with AirFlow Mesh fabrics while allowing a muted view to the outside. Breezes pass through adding pleasant comfort to the area.